We recently obtained a Mystery Mew distribution cartridge. It is the original distribution cart containing the event MYSTRY Mew 06930! 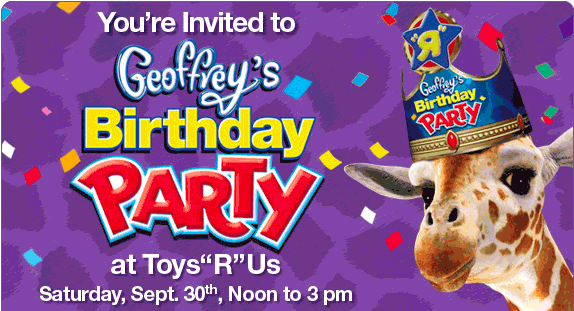 This Mew was distributed as a perk for attending Geoffrey the Giraffe's Birthday Party at Toys”R”Us stores across the USA on September 30, 2006, from 12 PM to 3 PM. 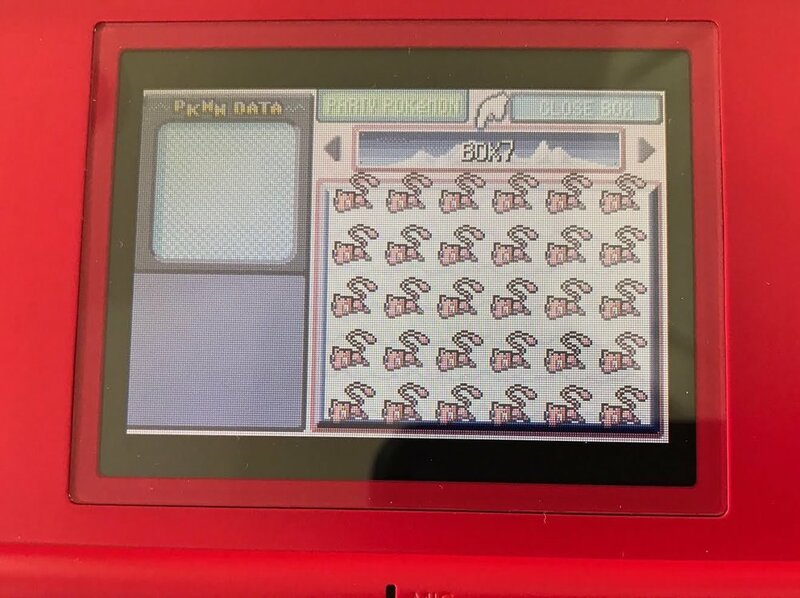 This particular cartridge is important because it contains a MYSTRY Mew, which we did not have before. We are asking the community to help pay for this acquisition since the auction was very expensive. After fees, the cartridge cost us a whopping $900! Please help us by donating to Deoxyz, who got this cartridge on credit. Special thanks to @HaxAras and @Deoxyz. Also, thank you to everyone that has donated so far; any future donations are appreciated. Reply to this thread or contact an administrator with any questions or comments. Many of us donated to support this. Keep in mind that more donations might help to get more rarities like this in the future. Nice! I'm amazed that untouched carts even existed nowadays. Thanks for your efforts and also thanks to all the contributors! We still need donations! This cartridge cost us over 900 dollars after fees and we are currently nowhere close to paying the paypal loan shark back. Any donations are appreciated to help us cover the expense, as the end result is something that will benefit our community as a whole in regards to event preservation and legality. To clarify, donations are to be sent through PayPal, to "deoxys04@gmail.com". Any donations will go immediately towards paying off PayPal Credit. Any chance you guys could set up a PayPal donate button somewhere to facilitate the donation process? I'd also consider asking for donations on GBATemp and Digiex, that'd definitively help reach the goal quicker. 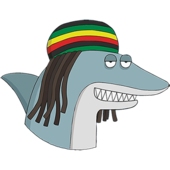 For anyone on the fence with contributing I know Deoxyz has personally invested a lot of his own money (were talking $1000's) in both the 10ANNIV and Aurora Ticket Distribution then released them for free asking for nothing in return. In addition he was the one who got us a distributed set of the French, German, Italian and Spanish 10ANNIV Pokemon, along with the Aura Mew in English, French, German, Italian and Spanish for the GEN 3 event save myself and HaxAras has spent a lot of time on last year. 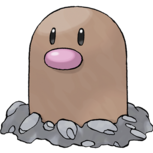 Something we learned a lot later on that the research team here didn't even have these Pokemon. So needless to say if you value these old, rare Pokemon event's and want to see people enjoy them now and in the future it's well worth donating anything you can justify in my opinion. Sadly these old events are usually hoarded away in private collections never to be seen again, when a chance to obtain them comes up its often very costly unfortunately, Deoxyz has absorbed this up front on PayPal credit, however this and anything in the future is only going to be viable if the community comes together to make it happen. If this comes off their is also another event in the works, which has been for many months now. 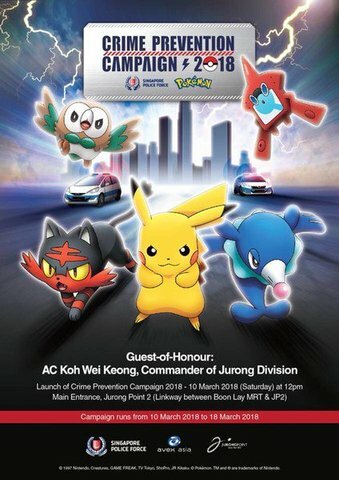 This is close to been finalised too, so this year could potentially be another good year for GEN 3 events. I'm just shocked SOMEBODY had an UNTOUCHED Mystery Mew cart lying around. 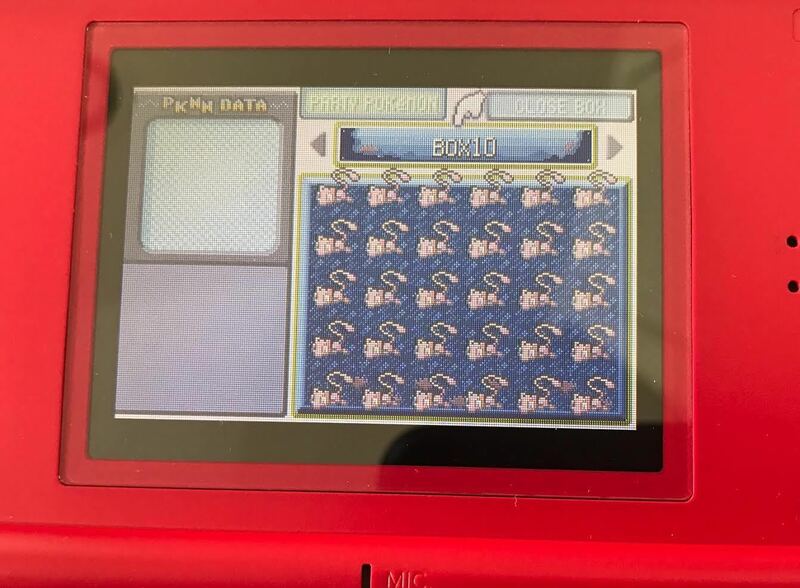 So not only will we get the missing Mews, we might also get to see what the original party was (I'm guessing either another Mew or a starter). I too want to vouch for @Deoxyz, whom has been contributing to us throughout these years. I am concerned about the fact that there's an untouched mew cart lying around (it could easily be cloned save, and the other save has been touched all over, but that's not the point here). We actually don't have pictures of Boxes 6, 9, 13, and 14. From what the seller told me, there were a few traded pokemon in one of those boxes, but he didn't tell me how many. So it's not 100% untouched as a whole(such a cart may not even exist), but the Boxes we needed the remaining lost Mews from(1, 2, and 3) are untouched. 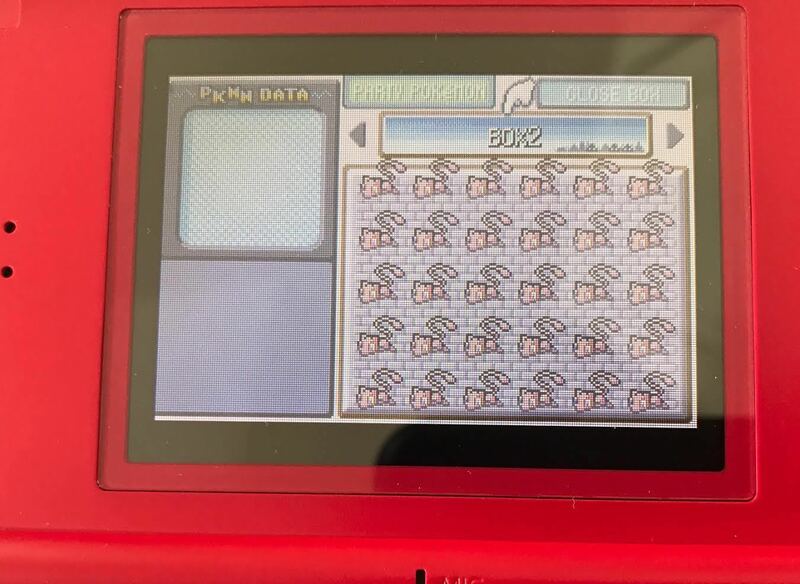 However he said there's over 400 Mews on it(out of 420), so there's probably only a few traded pokemon. In that case we won't get to see the original party. Oh well, at least we'll have the remaining Mews. I actually ran one of these events and they had me take the cartridge and system home to test it by trading with my own game the night before! If I had any idea how rare these cartridges would be some day, it might have gone "missing" after the event, lol. It was amazing what some of those kids were willing to trade away to get their Mew. We kept telling them to catch an extra Rattata or Pidgey to trade, but some kids were trading fully evolved and legendary pokemon. I'm really not surprised if this was a legit event cart. Some TRU are not known for returning those event carts and systems in a timely manner, if at all. 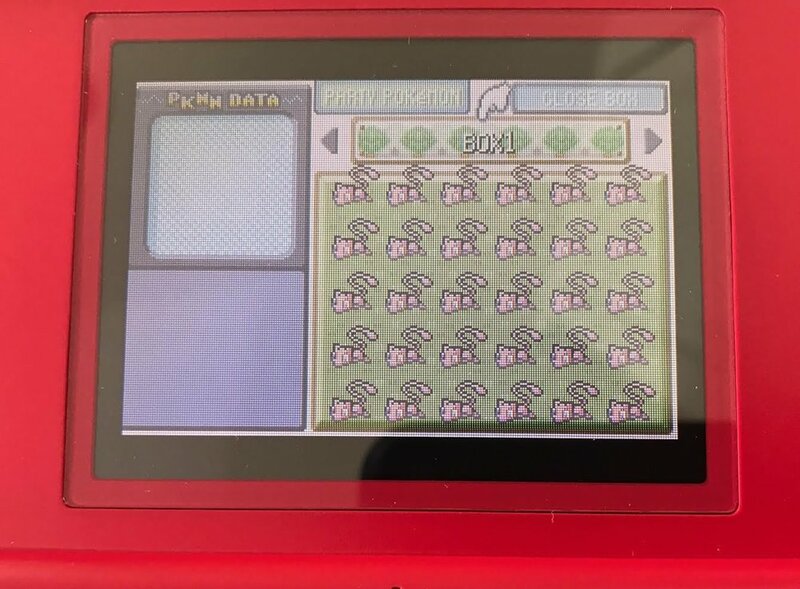 I remember having a DS with a Platinum/Diamond event cart sitting in a box in the managers office for months after one of those in-store download events. 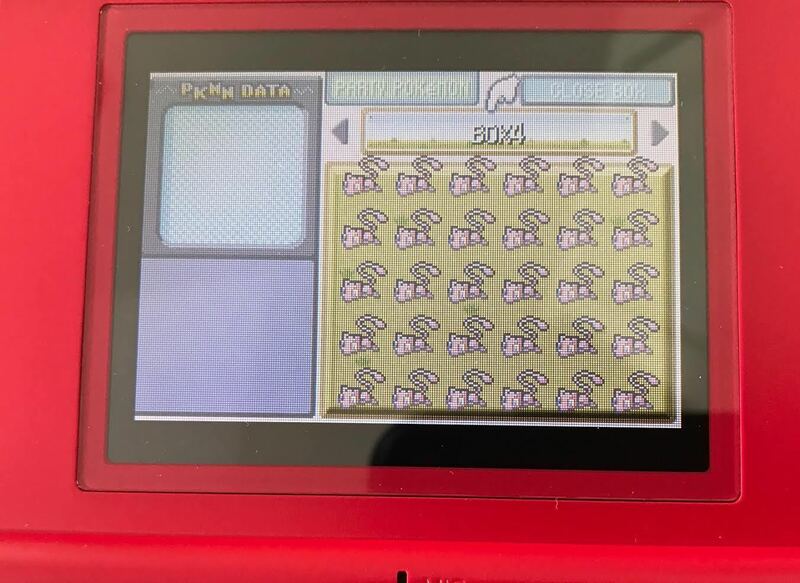 @Deoxyz And I both found the Pokemon people traded to be interesting. We both found it odd to see shines and Pokemon like that in the carts. That explains it. The kids didn't understand they could offer anything for the Mew. @kyle72686 It's always interesting when people who ran old events come forward with information like this. I guess if they let you take it home, considering others were allowed to do so, I guess that could've theoretically allowed someone to dump an untouched savefile. Though I'm not quite sure if dumping was as easily accessible in 2006 as it is now. While several legitimate Mew carts have leaked, unfortunately the majority you'll see on eBay are just repros people made by coping public savefiles to any retail FireRed cart. Toys R Us in general though is known for being much tighter with making sure these carts weren't stolen, versus stores like GameStop. That's why the DS distro carts from TRU are so much rarer than those from GameStop, at least before the trash heap of thousands of damaged carts was found a couple years ago. Save dumping was possible back then thanks to GBA Action Replay, so it's possible (yet unlikely) for an untouched save to be out there somewhere. Additionally, there's a thumbstick that can be plugged in to the link cable slot to back up and restore saves (kinda like homebrew) so anyone with that could back up saves too! 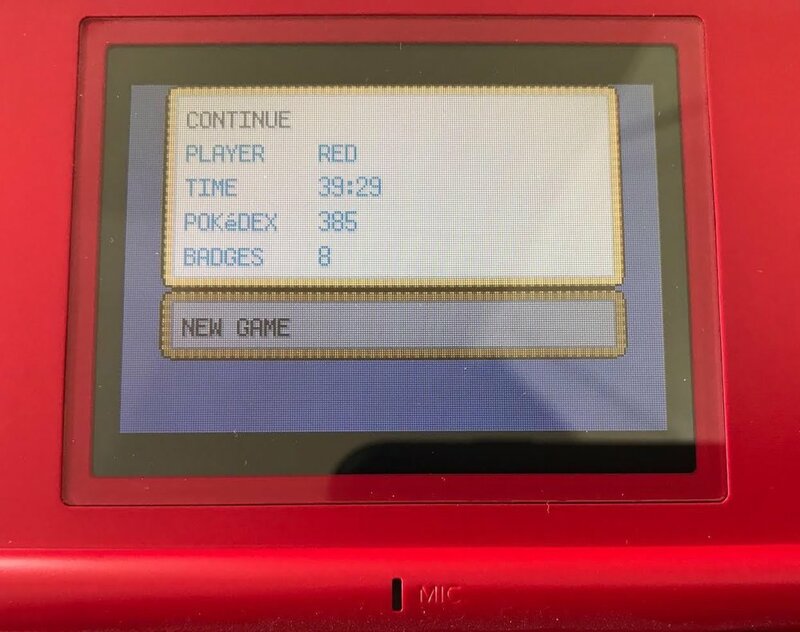 Looks like the seller has put the cartridge up again... any idea what's up with that? To me it looks like the seller either isn't actually going to send it (unless it's already arrived), or, more likely in my opinion, has dumped the save so he can just keep selling it over and over. They claimed they had 2 of the carts and even if they re-wrote the same save, we have everything we need from it currently. Also, as somebody who has sold stuff on ebay before. They may have just gotten lazy and re-listed the old listing with the same pictures. Because it's tedious to take new pictures for the same item. 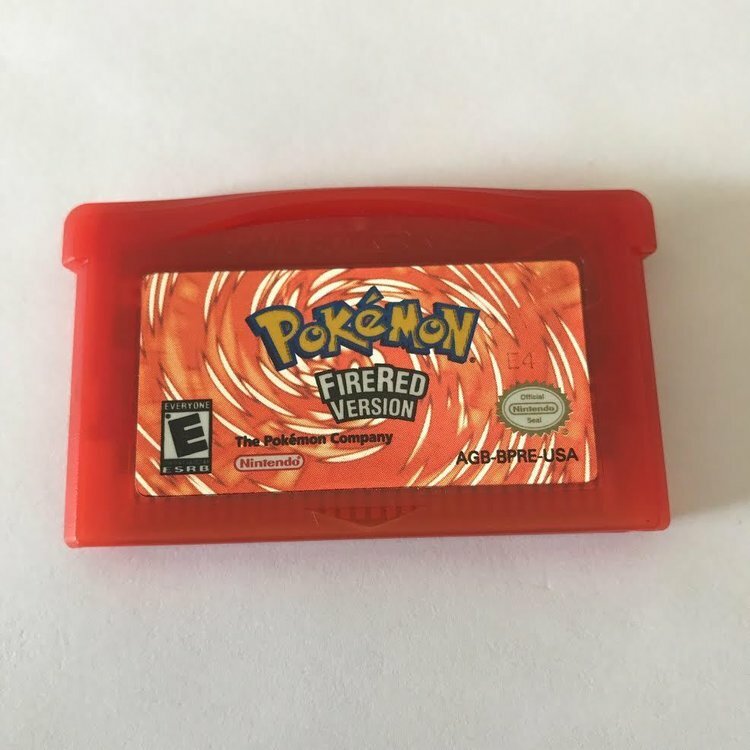 It's a different cartridge. 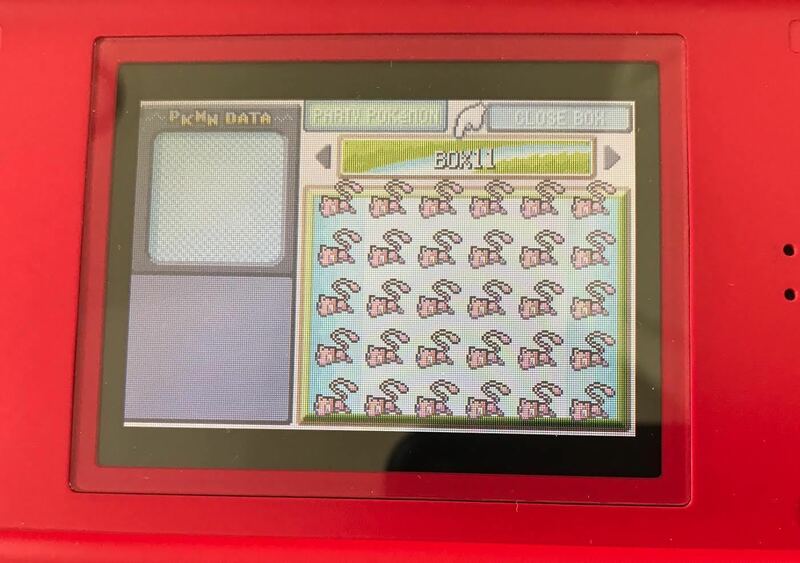 In this cartridge BOX 13 and BOX 14 are full of Mews, while in the other cartridge they're used. BOX 1 and BOX 2 were being used in this cartridge while in our case they're unused. Yeah, that's his other cart he mentioned to me. I think he reused the menu screen picture, because I doubt both are 39:29 on playtime, but the boxes are obviously different. Which is what he told me, his other cart had a completely different layout in the boxes. And yes, we have the cart. Legitimacy checked out fine. Guess I should have paid closer attention, I saw the same couple of images, and in particular the same image with playtime on it, and assumed the rest would be the same as well. Glad to hear everything's fine. 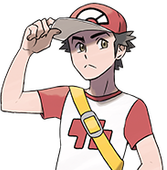 I was actually wondering if you were part of the JEREMY event mons as well? 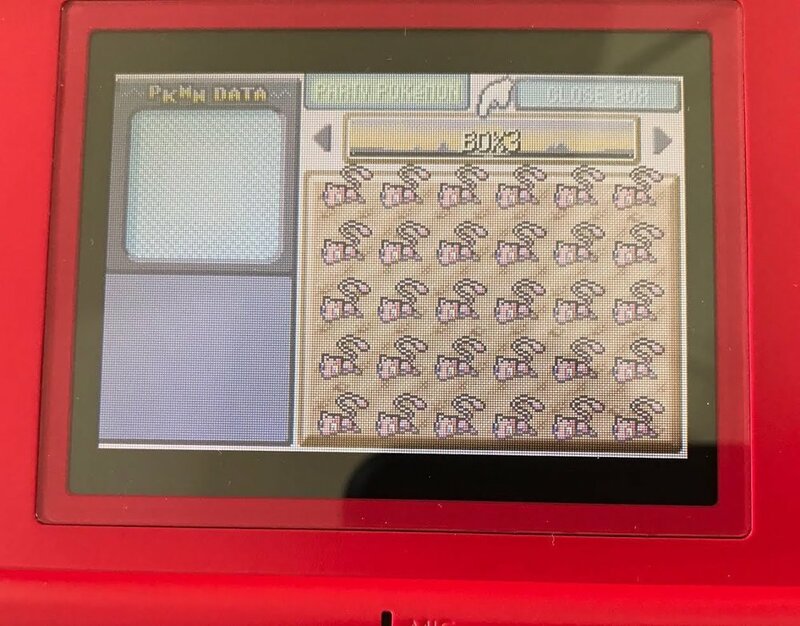 I've been wondering if the Pokemon on the cart were all in separate boxes or if they were all in an order that was repeated throughout the saves. I also wonder what the OT name of the save was. 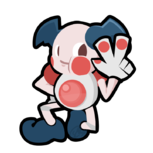 If it was theoretically possible for somebody to trade an evertstone to a Toys R Us employee and prevent the Haunter and Machoke from evolving and what the original met locations were. I was able to determine a few but had to guess the rest. 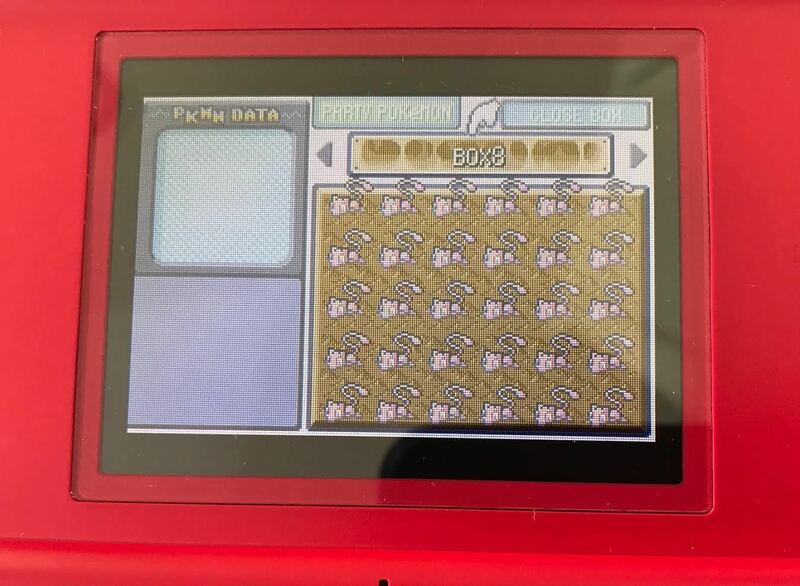 @HaxAras I still find it somewhat odd that no JEREMY savefile/cart has leaked (that we know of) when Mystery Mew has had several, yet both were Toys R Us events distributed by direct trade from FR carts, spanning only about two years between each other. Perhaps that can be something I'll look into after the current two projects are said and done. Though since it is a normal cartridge, it would be theoretically possible for the everstone situation. I doubt an empoyee would've given someone the extra time to do so though. JEREMY pkm are just captured wild pkm that were cloned; there's nothing special besides being free version exclusive trades. They were a local trade event Pokemon from gen 3. I still find them interesting. 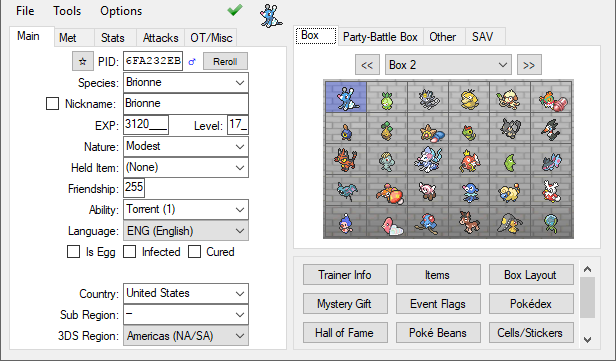 Since there were 12 JEREMY mons, I think that each one might have had it's own box in the PC. Which could explain why some like Oddish and Sandshrew are rarer than the others. Of the Mystery Mew files we have, almost all of them have the first few boxes traded and most of the others ignored. 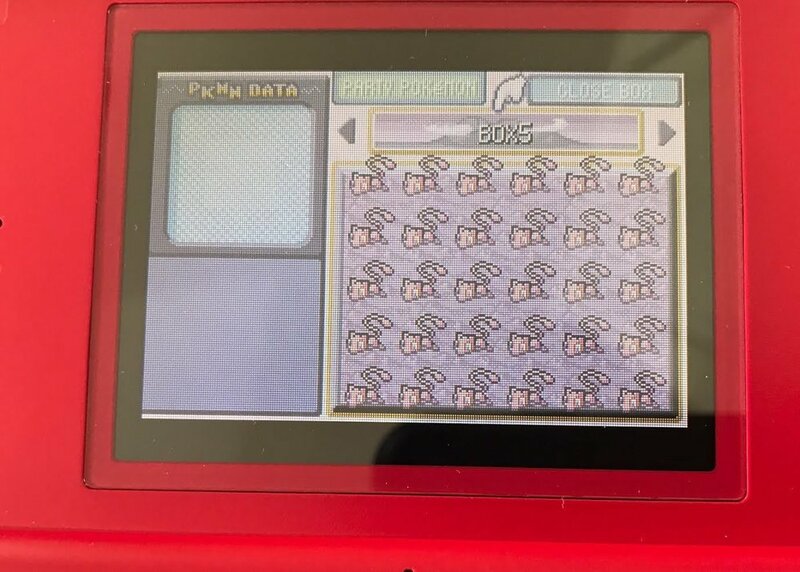 Maybe the people doing the trades for the JEREMY mons ignored the last few boxes for the most part, making those ones harder to find.